Build and sustain a culture of curiosity, creativity, and critical thinking that transforms Rhode Island into a leader in innovation for generations to come. Maintaining a physical space for multi-generational learners to explore, experiment, and create together in a supportive and fun environment. Creating hands-on, and minds-on, exhibits/experiences that offer opportunities for open-ended experimentation and creative problem solving. Creating portable programs, workshops, and media resources that develop learners’ curiosity, motivation, grit, and problem-solving skills. Collaborating with other community groups, leveraging Rhode Island’s rich resources in the arts and sciences, to maximize our collective long-term impact. Originally founded by three Rhode Island women who wanted their state to have a place for people of all ages to use their hands and engage their minds, RIMOSA was modeled to some extent on the hugely successful San Francisco Exploratorium. 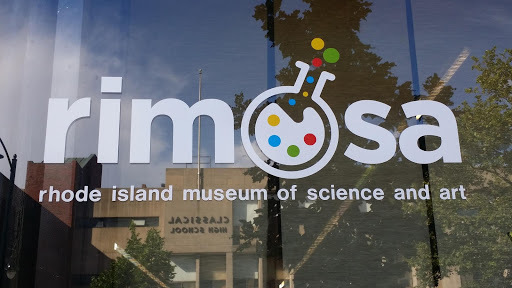 The Rhode Island Museum of Science and Art (RIMOSA) became a Rhode Island non-profit corporation in August 2009, a federally recognized 501(c)(3) organization in February of 2010, and didn’t have a dedicated physical site until June, 2017. In that time, our board grew from three to twelve people, incuding scientists, artists, musicians, writers, company founders, parents, teachers and more. We grew slowly and organically, designing and building exhibits, when we had the funds, that exemplified our mission in their open-ended nature, and developing programs – as they were asked for - that were hands-on, collaborative, and catalysts for future learning. When we didn’t have a site, we partnered with libraries, after-school programs, Boys and Girls clubs, festivals and more to present our programs and exhibits. Now that we have a site, we still eagerly partner with other organizations to present our programs and exhibits at their sites – because we want to serve ALL Rhode Island. Our goal is to inspire people, first to say “wow!” then to reach out and interact, and lastly, to take the ideas with them when they left us and experiment further on their own. We’re still a very young museum, and as we like to say, we were not intelligently designed – we evolve! If you would like ot help us evolve and grow, please contact us at info@rimosa.org!